September 2017 was all about water-soluble graphite! 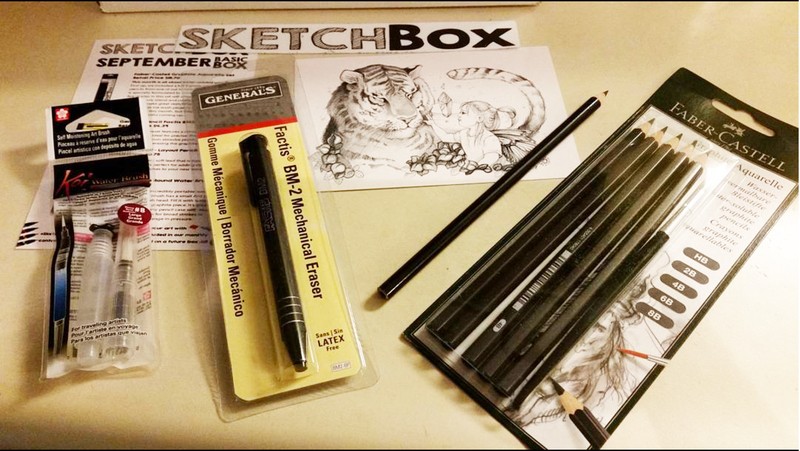 First up, we included a full 5 grade set of water-soluble pencils from one of our favorite brands Faber-Castell. The graphite in these pencils is specially formulated to work well with water. The five grades in this set will allow you to use a wet brush to seamlessly blend and create watercolor style effects! They also make great sketching pencils for your other watercolor or ink wash projects. Not only are they a great set for this month, but they’ll pair well with the next two months coming up! Next we included a General Pencil Factis BM2. This Pen Style eraser features a retractable holder and a latex-free eraser. Ideal for precise, fine detailed erasing. It contains a soft, non abrasive plastic eraser. Use it to add highlights by erasing the graphite. Next up we included a General Pencil layout pencil. This pencil has a very soft lead that is equivalent to a 6B. The extra dark line is perfect for adding details, outlines, and adding final touches to your new water-soluble graphite piece. Finally we included an incredibly portable water brush from Sakura. This water brush has a small 4ml tank and a large round nylon brush head. Fill it with water and use it to blend your new graphite piece. It’s great for plein air work and fits in any pencil case with ease. It’s large brush head allows for broad strokes or precise blending with a change in pressure. This picture was taken by our subscriber @gothgirlpoetess on instagram!